UPS came today. 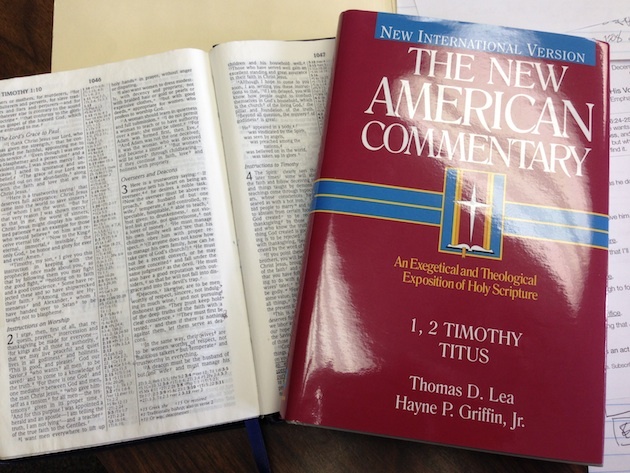 My monthly only a preacher would get so excited biblical commentary delivery. Ran to my office. Like a kid. Got scissors. Slit the packaging. Slid out the commentary. Shiny. Stiff. Which one? They don't tell a guy what's coming. It's a sort of preacher surprise program. Not like the unexpected deacon with a long face and something on his mind surprise. This is a good surprise. 1 & 2 Timothy & Titus. The Pastoral Epistles. Written by Thomas D. Lea & Hayne P. Griffen, Jr. I held it. Tears welling. Throat lumping. Dr. Lea. Tommy, as others but oh not me out of respect, call him is the father of one my best friends, Cliff. In his home. In his seminary classroom. Through Cliff. I learned so much more than a commentary might contain. How to walk, really walk, with the Lord daily. Gentleness of steadfast strength. Scholarly discipline that could communicate with the simplest. Husband enamored & expressive. Daddy proud & forthright. Kind, easy humor. Captivating demeanor. Humility in authority. Grace of bearing. Perseverance through terrible trials. Dignity no matter the circumstance. Love so deep everyone knew it was supernatural. Bright outlook of unwavering faith in our loving God. Legacy solid. Dr. Lea is with the Lord now. Dr. Lea is still teaching however. Here I sit. Pastor in an office. His book before me. Throat still lumpy. Eyes still watery. Dr. Thomas D. Lea. A godly man.